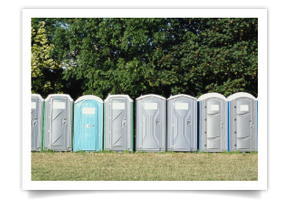 When you have an upcoming event where a large number of people is going to gather, Country John’s Portable Toilet Rentals has your answer. We can accommodate either tens or hundreds of guests in one area, or several thousand people transitioning in and out on a multi-acre site. Nothing enhances the enjoyment of the outdoors more than the peace of mind of knowing that there is always a clean, functional restroom and wash facility not far away. Your guests and customers will be inclined to stay longer and keep coming back if they know that their personal needs are well-provided for in the nice weather. Our units and stations are also perfect for employees or contractors who find themselves working on location projects that are designed to take a while to complete. With so many other things to worry about like deadlines and budgets, who needs the inconvenience of worrying whether or not there is a toilet nearby? Unfortunately, extreme weather patterns do occur from time to time, leaving a terrible path of destruction in their wake. There are also accidents involving large land and air vehicles, refineries or other institutional holdings that frequently happen without notice. In these instances, we are glad to provide you with the comfort of knowing that there is a restroom available for those who may find themselves suddenly without one. Contact us today to select your number of units and to schedule your rental.